Orange County newspaperman Charles H 'Chuck' Loos, who spent 40 years reporting on Orange County and training reporters, died March 26, 2015, at age 80. Chuck began his career at the Daily Pilot in 1961, covering county government and later education. Before that, he graduated from the University of Colorado, Boulder, and served a tour of duty with the US Army. He left the Daily Pilot in 1982 to work as executive editor for a group of San Gabriel Valley weeklies. He was then recruited to start a business weekly in Irvine. He ended his career as associate editor of the Irvine World News. Chuck was proud of covering most of Orange County's biggest stories, including the Nixon years at the Western White House in San Clemente and the county's bankruptcy. He retired in 1999 after the death of his first wife, Judith Harrington Loos. He then discovered a new passion in golf - a sport his father had played professionally. 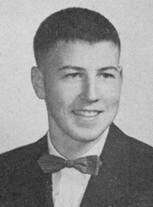 Chuck is survived by his wife, Phoebe Jenks Loos; son Scott (Sara) of Santa Ynez; daughter Joan and her partner Monica Tuscher of Laguna Beach; five grandchildren; and sister Margot Loos Downs (SPHS '48). A son, Michael, died in 1991.